Organizing projects, events, and anything else you can imagine is simple with the Vertical Events TimeLine Chart. 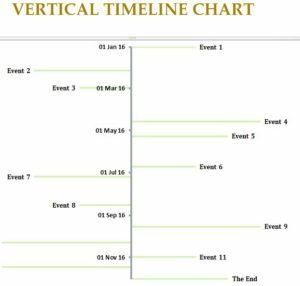 This free template document has everything you need to create the vertical timeline chart. This can be used in a variety of different ways and now you have the power to organize anything in life you choose. Simply enter the data for your needs and watch as the template automatically uploads your data and translates that into a helpful timeline chart. If you’re ready to get started with this free template today, just follow the set of instructions below. To download the free template document, just click the link at the bottom of this page. Next, look at the bottom of the sheet and notice that there are two tabs. The one you need to start in is the “Data Table” tab. There is nothing simpler than this tool. There is only one table that requires a few pieces of information to create your own timeline. You will simply enter the day, the event, and the height. The event section is a small description of the item you want to list. The height setting is how your item will appear in the timeline itself. A negative value will place the item below the timeline. By adjusting the height, you can make the timeline look just the way you want it to. When you finish, go to the “Chart” tab. This is the main setting of your template and where you can see the fruits of your labor come to life. As you progress through the month, you can see exactly what you need to accomplish, like your own visual schedule! To download this free template, just follow the link below.